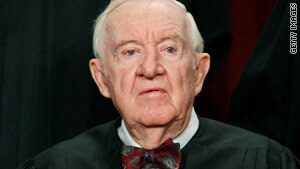 The Supreme Court announced Friday that Justice John Paul Stevens will retire. 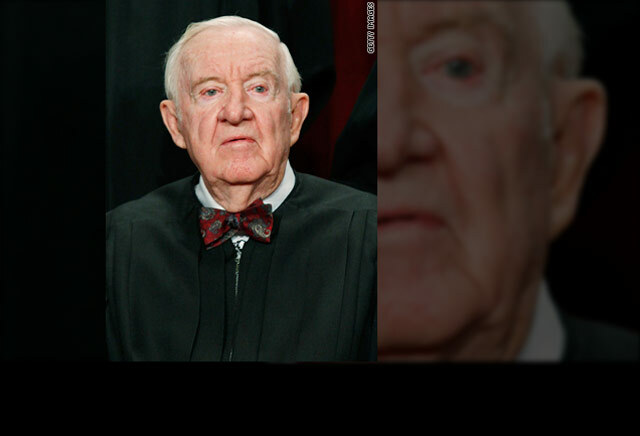 NEW: Court colleagues praise Stevens' "distinctive insights," "keen intellect"
John Paul Stevens says in letter that retiring before October is in "court's best interests"
President Obama on justice: "His leadership will be sorely missed"
Washington (CNN) -- Supreme Court Justice John Paul Stevens said Friday he will retire this year, giving President Obama another opportunity to shape the nation's highest court. Stevens, who turns 90 on April 20 and has served nearly 35 years on the court, announced his resignation in a brief letter delivered to the White House at 10:30 a.m. Friday. Obama lauded the retiring justice Friday afternoon and said he will move quickly to fill the vacancy before the court reconvenes in October. "He turns 90 this month, but he leaves at the top of his game," the president said from the White House. "His leadership will be sorely missed." Stevens referred to the timing of his resignation in his letter to Obama. "My dear Mr. President," Stevens wrote. "Having concluded that it would be in the best interests of the court to have my successor appointed and confirmed well in advance of the commencement of the court's next term, I shall retire from regular active service as an associate justice ... effective the next day after the court rises for the summer recess this year." Video: Will Obama seek moderate for court? He signed it, "Most respectfully yours." White House counsel Bob Bauer discussed Stevens' retirement by telephone Friday morning with Obama, who was returning from Europe aboard Air Force One. Stevens was at a second home Friday in Fort Lauderdale, Florida, a court official said. Stevens received praise Friday from his counterparts, who thanked him for his contributions to the high court. "In many, many cases where he did not write he brought to conference brilliant and distinctive insights that affected the outcome," Justice Antonin Scalia said in a statement. "I shall miss his brilliance, and his companionship." Justice Clarence Thomas echoed the sentiment: "I am certain that he will be remembered for his keen intellect and his prodigious body of work here at the court. And, he should be." Vice President Joe Biden recalled how Stevens administered the oath of office during his swearing in as vice president. He described Stevens as a man known for his work ethic, and thanked him for his service. "Throughout this span of years, all Americans have benefitted from Justice Stevens8216;s commitment to our core constitutional values and to the fair and restrained application of the law to all parties before the court," Biden said in a written statement. "His legacy as a justice will endure, beyond the confines of a particular judicial ideology, because it reflects the profound humanity he brought to bear to the task of judging." Speculation over Stevens had increased after he confirmed last fall he hired one law clerk for the next court term, which begins in October. Sitting justices can hire four law clerks, while retired members get only one. Stevens also was not on the bench for a brief public session Monday; the court will hold its next public session in two weeks. The White House has quietly but actively prepared for weeks in anticipation of a vacancy, government sources said. However, interviews with prospective candidates would not occur "soon" and "definitely not this weekend," a senior administration official said. The White House has a list of "about 10" names as potential replacements for Stevens, the senior official told CNN. Some of the individuals have "already been vetted," said a second senior administration official, referring to those considered when Justice Sonia Sotomayor was chosen. Obama nominated Justice Sonia Sotomayor last year, putting the first Latina on the court. Democrats cited the choice as a uniting force among progressives, saying it gave the president a signature moment in his first year in office. White House officials privately express hope another high-profile nomination would build political momentum in an election year. "There isn't an immediate candidate who could give them just as much [in] the second go-around," said Thomas Goldstein, a prominent Washington lawyer and founder of Scotusblog online. "There isn't a candidate who has Justice Sotomayor's personal history and also her ethnic background. But I think that the model for the administration is probably the same -- get someone in there who doesn't generate a lot of political heat against you and is a relatively easy person to confirm." Senate Republicans immediately laid down their markers Friday over what they expect from Obama. "Every president has an obligation to nominate judges who understand and are committed to their proper role in our system of government," said Sen. Orrin Hatch, R-Utah. "As I have said for many years, someone who would be an activist judge, who would substitute their own views for what the law requires, is not qualified to serve on the federal bench." Senate Minority Leader Mitch McConnell, R-Kentucky, also cautioned against picking what he called an "activist" judge. "Americans can expect Senate Republicans to make a sustained and vigorous case for judicial restraint and the fundamental importance of an evenhanded reading of the law," McConnell said. Democrats asked for a bipartisan approach. "I encourage my Republican colleagues to join us in conducting fair, respectful hearings and swift confirmation of the president's nominee," said Senate Majority Leader Harry Reid, D-Nevada. Sen. Patrick Leahy, D-Vermont, made a similar plea. "I hope that senators on both sides of the aisle will make this process a thoughtful and civil discourse," Leahy said. "I expect President Obama to continue his practice of consulting with members on both sides of the aisle as he considers this important nomination." Stevens was nominated by President Ford and took his seat on December 19, 1975. Before his appointment, he served from 1970 to 1975 as a judge on the 7th U.S. Circuit Court of Appeals. Stevens also was an associate counsel for the U.S. House of Representatives Judiciary Committee from 1951 to 1952 and was the second vice president of the Chicago Bar Association in 1970. Stevens received a bachelor's degree from the University of Chicago and later graduated from Northwestern University School of Law. He served in the U.S. Navy from 1942 to 1945 and was a law clerk to Supreme Court Justice Wiley Rutledge during the 1947 term. He was admitted to practice law in Illinois in 1949. He married Maryan Mulholland. He had four children from a previous marriage -- John Joseph (deceased), Kathryn, Elizabeth Jane and Susan Roberta. 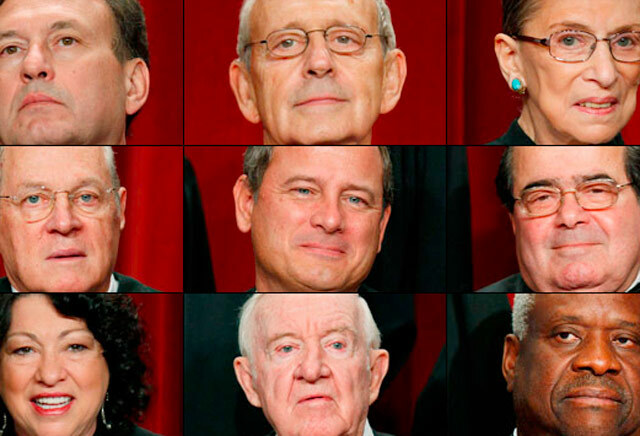 Learn more about the nine people who sit on the highest court in the U.S.